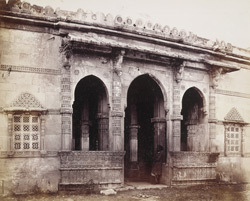 Photograph of an entrance to the south of the façade of the Bibi-ki Mosque at Rajpur, Ahmadabad in Gujarat, taken by Henry Cousens in the 1880s, from the Archaeological Survey of India. The Bibi-ki mosque, one of four in Rajpur, was built in 1454. It it is vast structure with five large domes. At the north end of the mosque is a royal gallery enclosed by perforated screens. This view shows an unusual triple arched entrance on the facade, south of the main central entrance. The two flanking windows are perforated with twelve panels, each with a separate pattern.